“Will my customers relate to the brand name I’ve come up with?”. “Does the name fit with the brand identity I’m creating?” “Will my brand name get attention?”. If you’ve found yourself asking these key questions, you’ll know the name game is far from simple. As the age of information gives way to innovation, and a new brand is born every other minute, there’s no better time to come up with a winning strategy for one of your most important business assets: your brand name. So today I’m going to give away The Name Plan: my secret strategy for coming up with killer brand names — whether you’re naming a company, product or service. It will help you to create brand names that resonate with your customers. Brand names that are a perfect fit for your company. And brand names that put you above your competition. In fact, if you’ve been paying attention, I’ve already told you the secret. But if you’re not sure yet, stay with me. To arrive at The Name Plan, I first looked to Kenichi Ohmae’s 3C’s Business Model, which points out that a strategist should focus on three key factors for success: The Customer, The Company, and The Competition. 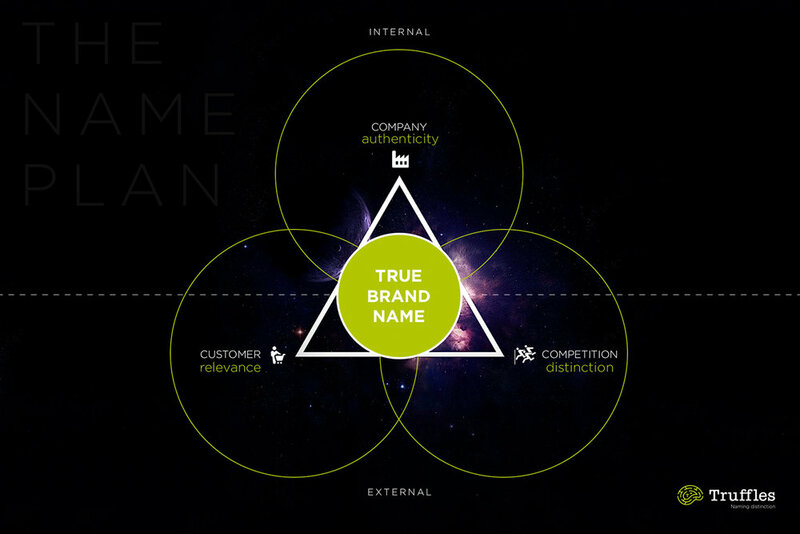 Keep this trinity in mind at the beginning of every brand naming project. You could be forgiven for thinking that having a brand name that is relevant to your customers sounds obvious. But even massive companies get it wrong. Take Andersen Consulting who is reported to have spent $100 million on its rebrand. After internally crowdsourcing its name via an internal competition, they settled on the vapid Accenture. According to Business Insider Australia’s Bianca Male in 10 Major Rebranding Disasters and What You Should Learn From Them, she reports: “Although it (Accenture) was supposedly inspired by the phrase ‘accent on the future’, it tells the customer nothing.” Instead customers should seek to denote or connote (imply beyond the literal meaning) the value of their company, product or service through a relevant brand name. Google is a highly successful case study in rebranding the right way. Originally the gargantuan search engine was obscurely named ‘Backrub’, a reference to an underlying algorithm that counts backlinks as affirmative votes. I’m not sure what that means either but needless to say, this in-joke for nerds wouldn’t have struck a chord with the wider public. Fortunately, Backrub became Google a year into its development. Why is Google a relevant name? Most people would likely have heard that this coined name stems from a clever misspelling of the word ‘Googol’ — the number 1 followed by 100 zeros, which signifies that the search engine provides significantly large quantities of information, precisely the function of the service. And it’s interesting little stories behind names like this one that pass into folklore and go viral. So if you didn’t know the relevance behind ‘Google’, you do now. Even if it’s not always obvious, a name should have a strong relevance to the essence of the company, product or service you’re selling. Rule #1 to having a great brand name is to determine what your promise or relevance is to your customer, so write up a value proposition. This rule is often overlooked — even by some of the biggest brand naming companies. But it’s one of the most important because it speeds up the process of finding the ‘right’ name. During the naming process you may hear stakeholders comment: “There’s something not right about that name” or “I’ll know the right name when I see it”. What they often can't articulate is that the name is not the right fit for the company’s personality. This scenario happened when I had the privilege of working client-side after engaging a large international naming company. They did an amazing job of coming up with some highly creative names, but initially were way off base with some names. My colleagues were left bemused by some of the suggestions put forward by the international naming company: "They just don’t seem to get us”, which translates into “They don’t understand our brand personality”. So what is brand personality? Major brands today take on human traits and communicate in ways that remind us of people. So it stands to reason that once you know what type of brand personality your company, product or service is, then your name should also evoke this personality. For instance, Dove conjures up feelings of peace, care and devotion which is the perfect personality for a beauty company who cares for women’s issues. Whereas FCUK is a cheeky, linguistic middle-finger to society and encapsulates the clothing company’s rebellious spirit. Lastly, Victoria’s Secret is a brand name that oozes sensuality and mystery, an ode to the lingerie company’s 'lover' personality. Three major brand names — Dove, FCUK, and Victoria’s Secret — conveying three very different brand personalities, just in their names alone and without any other surrounding brand elements. This is why personality matters. Because if you know who you are, it’s easy to discount what you’re not. To find your brand personality dig deeper into brand archetypes. Last but not least, the power of a great brand name lies in its potential to go against the grain and zig when others zag. It’s shocking to learn but many marketers fall into the trap of choosing names that look, feel and sound just like their competitors, and therefore they lose out in the biggest war that is occurring right now — the war for your attention. Names that mimic your competitors tend to poll really well with naming committees because they are familiar and therefore bring comfort. No one in a group wants to go out on a limb and choose a daring name that they think everyone else will disagree with. But comfortable names, often descriptive names, are so ‘dime a dozen’ that they’re difficult to trademark and therefore do nothing more than serve to waste time and money. And if you do wind up selecting a bland, boring and familiar name then you fail a simple marketing objective: to gain your customer's attention, which is the most precious commodity. And failing to gain the attention of customer’s today in a highly competitive world, a world saturated with marketing messages (as many as 10,000 brand messages a day), is brand suicide. The brand name Apple is a classic example of predatory brand naming — analysing what the competition is doing and then going in the opposite direction. Whether Jobs and Wozniak were aware of this or not, what they effectively did with Apple was to distance themselves from the cold and sterile imagery of computer company names like IBM, Digital Equipment and Cincom. In Steve Rivkin's article How Did Apple Computer Get Its Brand Name he cites that Steve Jobs said that the name sounded “fun, spirited and not intimidating”. In essence, the name was simple and accessible, and these two traits lie at the core of Apples brand principles. Not only did the name stand out from the competition (Rule #3), but it was highly relevant to its customers who valued simple and accessible computers (Rule #1). And to top it off as being a killer brand name, an apple ties into the mythology of Sir Isaac Newton and the discovery of gravity. That’s a clear connection with Apple’s personality of being ‘The Creator’ (Rule #3). So much so that Apple used a picture of Sir Isaac Newton in their first ever logo. Apple is a clear example of a R.A.D (relevant, authentic, and distinctive) brand name. So to recap, in order to create killer brand names you need to remember the 3Cs (Customer, Company and Competition). Your brand needs to be R.A.D. (Relevant, Authentic and Distinctive). And in order to be R.A.D you need to know how to write a value proposition, determine your brand archetype, and run a competitive analysis. Now you know The Name Plan, if you need help with any tactics for you next brand naming project get in touch with Truffles today. Older PostMarketer's Stress? Remove a plate. Listen to strangers. And let go.